Player: Choose any of the available characters/character teams. Items: Chosse between all Sonic 2 and Sonic 3 monitors, including the hidden ones. Flight: Toggle Tails ability to fly. Air Cap: Toggle the air speed cap. Unused monitors and various objects. Unknown object for Chemical Plant Zone. Boss animation for Chemical Plant Zone. Pillar found in amongst the Aquatic Ruin Zone graphics. A standing frame for the Balkiry. Walking animation for the turtle. Continue screen animation from Sonic 1 (2013 game). These are leftover Tails life icons from the 2011 Sonic CD and Sonic 1 port. Leftover timer marks from Sonic CD (2011). Likely related to Retro SDK's level editor which is used to create the game. 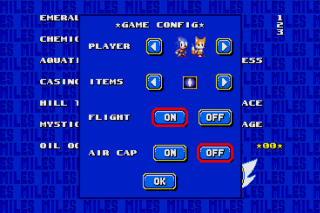 The same icon was found in the Sonic CD and Sonic 1 port. "S" monitor which causes the player to become Super. Using this monitor is the only way for Tails to become Super in this game. Three Shields monitor which switches the items option on or off. Changes take effect either when the act is restarted or when the next act is reached. Emerald Monitor. Breaking it will give the player all the Chaos Emeralds, or take them all away. Spring monitor, which also exists in the Nick Arcade and Simon Wai prototypes. The snail badnik from the Nick Arcade prototype has the same movement pattern as it does in the prototype. An alternate version of the Buzzer badnik. It behaves as it was planned out to in concept art. Its shots burn bridges, which will harm the player unless they have a fire shield. Another beta badnik in Chemical Plant Zone, it now works fully. It moves around slowly but speeds up if it comes in close proximity with the player. It drops Bubblers as it's attack. Dropped by Mother Bubble badnik and explodes after touching the ground. A stationary fireball for Chemical Plant Zone that harms the player, unless they are wearing a Fire Shield. A ball for Chemical Plant Zone that will float in the air, and give chase if the player is in close proximity. When above the player's head, it'll explode and drop chemicals. The Bubble Shield can protect against this attack. Aquatic Ruin Zone door which closes as soon as the player passes through it. Same as Grounder, but green. A homage to Adventures of Sonic the Hedgehog. Weird platform made of rings, placeable using debug mode in Mystic Cave Zone. It moves back and forth depending on which side you stand on. Checkered ball in Oil Ocean Zone that behaves like the checkered ball in the Sonic 1 2013 game. Wing Fortress Zone platform that shoots laser when it spins. Wing Fortress Zone spinning object. It behaves the same as in the original game and hurts the player. A 8th special stage is available in the sound test level selection menu. By selecting sounds 00 through 07 the special stage you enter when choosing the special stage will change. 00 is the first level and every number after that is the next highest level with 07 leading to the new 8th level. This level features a purple floor, corkscrew loop, and a light blue Chaos Emerald. As of Version 3.0.9 the Proto Hidden Palace Zone is accessable in the hidden stage select menu. Simply choose "Hidden Palace" in the menu. There are a few small differences from the Mega Drive incarnation. The water slide works and is fully implemented. 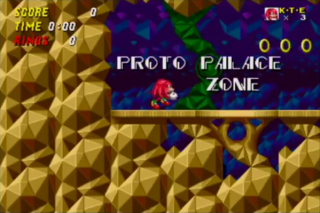 It is also impossible to get too far in the level as the large emerald acts as a stage clear warp instead of breaking to let players through the bottom. 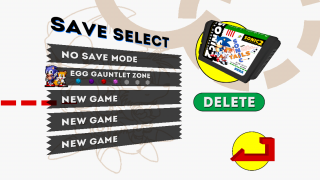 Egg Gauntlet Zone data remains in the final game but can only be accessed through hacking. It was the first attempt at a Boss Attack level that had some original artwork such as mechanical palm trees and flashing lights. It was to be a full Zone that acted as a testing facility for some of the bosses inventions rather than just have a level with bosses back to back. The act was nearly completed and needed just a few graphical changes to replace missing, unpolished, and placeholder graphics. 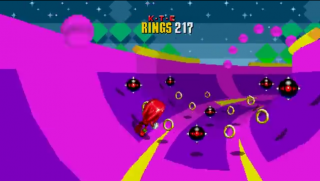 Sonic Team did not approve of changing the location, colors, or graphical style so the level was scrapped and the Boss Attack level that was used in the final game was created. A map of the level can be seen here. A youtube video can be found here. As of Version 3.0.9 the Zone was completely removed from the game.